For many, veganism is an ethical decision to protect animals from a gross manipulation. Having been vegan myself, it is a minefield of ethics; to manoeuvre oneself around the array of animal products so imperceptible in many everyday items. Photographic films and papers use gelatine made from the hides and bones of cows and pigs. Most wines and beers use fish swim bladder derivatives to improve clarity and remove impurities. A red food colouring known as carmine is made from ground beetles. Stearic acid made from animal fat is used in baked goods, beverages, car tyres and fireworks. Animal fats are also found in plastic bags, wood glue, bio fuels, shampoos, fabric softener and tooth paste. …In addition to the cattle, sheep, and other animals who are killed for leather in China, an estimated 2 million cats and dogs are killed for their skins each year. There is a huge amount of trafficking of cattle to both West Bengal and Kerala… I’ve seen 900 cows coming out of the wagon of a train, and 400 to 500 of them came out dead. On the route to Kerala they don’t bother with trucks or trains: they tie them and beat them and take them on foot, 20,000 to 30,000 per day. [All Kerala’s slaughter houses are on the border.] Because they have walked and walked and walked the cattle have lost a lot of weight, so to increase the weight and the amount of money they will receive, the traffickers make them drink water laced with copper sulphate, which destroys their kidneys and makes it impossible for them to pass the water — so when they are weighed they have 15kg of water inside them and are in extreme agony. So what are the alternatives? Pseudo–leather such as Naugahyde, Durabuck, NuSuede, and Hydrolyte have been created to satisfy the hide consumption but have not replaced the demand. 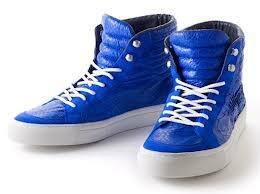 Petro-chemical based materials will take 500 or more years to break down compared to the 25 to 40 years of leather. 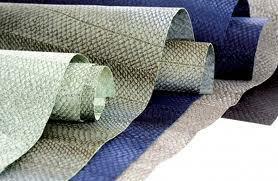 Fish skins are now being offered as an ethical alternative to the leather industry. The skins of supposedly non endangered species, sourced sustainably, that would have been discarded as by-products from the food industry are being adapted into a reptilian style leather. The tanning of the fish skins are similar to the process used in the leather industry, minus the polluting effect of harmful chemicals used in hair removal and preservation such as aluminium, chromium sulphide and mercury. This new leather has been adopted by the fashion industry and is bringing in the “eco” pound for its ethical credentials. The waste skins of salmon, trout, cod, wolf fish, Nile perch, pike-perch, tilapia and grass carp can be transformed into strong, lizard like clothing materials with a reduced environmental impact and the benefits of “recycling”. This sounds like an ideal solution to the leather industry with no negative impacts, but it is important to consider that when a product becomes popular and industry backed, sooner or later an ethical intention will be pushed aside in favour of money. Fish skin leather is now made from a waste product, but its manufacture may encourage the farming of fish purely for their skins. So how do we make a choice? We have to weigh up what is the least harmful now. Vegans may argue that any use of an animal product for our own benefit is causing ultimate harm to that creature. We need to curb our consumption of shoes, hats and bags. We need to reduce our waste of discarded materials that could be re used and re cycled. These are ethical aspirations we should work towards, but we need to focus on the here and now. Our consumption of leather is high and industry will continue to meet those demands without consideration of animal welfare. Pseudo-leather materials have been available for some time, but have never become a realistic competitor to animal based products. The use of fish skins have captured the fashion industry and could displace the abuse of farmed animals. While fish leather is making use of waste skins, the balance at present, tips in favour of this seemingly less damaging alternative. Should we put our efforts into cultivating an awareness of these alternatives to limit a destructive industry? At Buddhafield’s Green Earth Awakening, a tanner and leather worker will be offering workshops on how to make and work with fish leather. The intention of this workshop is to promote a sense of self sufficiency necessary to curb our consumption and reliance on mass industry. For some, this may be limiting in reducing our impact on living beings and the use of leather in any form should be boycotted. For other’s this may serve as an intention to finding alternatives to the damaging industry that is feeding our high consumption here and now. For all of us, perhaps we can unite in recognising our aspirations towards a society whose consumption and desires do not take priority over the welfare of living beings. This entry was posted in Ethics, Green Earth Awakening, News Headlines and tagged consumerism, Ecology, ethics, leather, Vegan by Rosie. Bookmark the permalink.